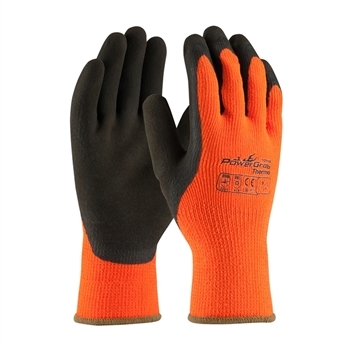 41-1400 PowerGrab Insulated Hi-Viz Thermo Work Glove. PowerGrab Insulated Thermo Work Glove. Hi-Viz orange acrylic terry shell. Seamless construction. Excellent thermal insulation. Brown Rubber Microfinish grip. Available In Sizes small, medium, large, xlarge, xxlarge.